How are you all? The weather is getting better everyday and to be frank I am sad that I'll miss the best part of summer this year because we are leaving for India. Of course India trip is quite exciting and it will be monsoon in Kerala which I haven't seen or felt for ages. This may be the last post before I leave, but you will be seeing many more recipes from me since I have so many in my drafts which Sunitha will duly post. But I won't be able to come and visit you regularly as I used to while I'm away. However, I hope you will continue giving us your love and support as always. I will share a simple snack today which I am sure many of you already make. This is for those who do not have a gas top or grill at home. Baking the corn. I'll soon update a post on grilling corncobs once I am back from India. 1.Preheat the oven at 450 degree F.
2.Clean up the corn , brush them with butter and sprinkle some salt, and place them on a baking sheet which has aluminum foil on it. 3.Bake for 30-40 minutes, turning them every 10 minutes. 4.Once they are cooked well, change the oven to broiler and broil them at 500 degree F for 10-12 minutes. Change the sides every 4-5 minutes. 5.Brush some more butter and rub with the lemon wedges and serve warm. Lovely pic namitha! I make it the same way! Nami..Amazing click as always..color looks gorgeous.. I love corn...your version sounds very interesting...goes to must try list...just amazing pic dear. Good road then,you know i love roasted corn,the cultivation in my giardino.Ciao. never tried this metod but is very easy and the end result is delicious. looks great too. Lovely click. I love corn on cob..it so reminds of summer in Chennai. You have a fun trip back home. I too love roasted corn a lot..nice color..great click dear. Enjoy your stay in Kerala dear..hope you have a really good time. I Bangalore, you get this on the street cart smothered with salt, chilli pd and lemon juice, love it. Great looking snack. Simple one..Hey Gul did you collect your awards from my site..2 of them Honest Scrap and show your favrite pic ? 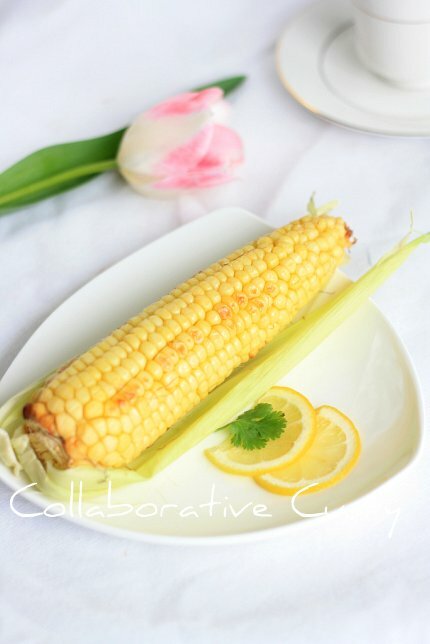 corn is such a wonderful addition to any summer dish! have a wonderful vacation with your loved ones..will miss you...hope to see you soon...corn looks yum! Lovely pics as always...tk care. Enjoy the vaccation with ur family..Kerala the weather will be good that time..enjoy the days..
Hi Nami, have a fabulous trip dear, will definitely miss ur sweet comments..oven roasted corn looks awesome and makes me drool.. Enjoy your vacation. Nice clicks i love baked corns. Very fresh! The picture looks great! I woudn't mind missing th summer here if i can visit India :-) When ever we are in kerala it is Monsson as we go there when our daughter is having her school holidays. Enjoy the monsoon and Kerala , family and food. This looks so so yumm, and i love the piure taste in corn when it is done like this. All time fav sanck..Looks so inviting.. Enjoy your India Trip. Take care. lovely picture Namitha. Happy holidays. corn looks perfect with tea. Lovely Pic Namitha! Enjoy your stay back home and have fun! I add chilly powder too as I like it spicy :) kure kalamayi undakittu...kothiyavunu. I too do the same way...Enjoy your kerala trip and vacation. Lovely pic. Have a great trip to India. aweosme click as usal..have a grat trip! i normally pressure cook the corn .never attempted this way. ur click triggered my tastebuds.so yummy.And have a great time in India. Have a super vacation. Cannot wait to see you back in action...but glad that Sunitha will keep CC running! TC n Haffun! The corn on cob pic is simply nice. I have never tried baking corn in the oven. I love the idea though. It sounds delicious. Have a great holiday! I love roasted corn a lot. Specially when it rains :-) Awesome clcik. Have a great trip dear and enjoy to the fullest. Had no idea about oven roasted corn...looks good. Enjoy your trip, have a great time. You know in monsoon time street vendors in my place used to sale something similar to this. They just use to roast them in clay oven and rub with lemon and chilly powder.Those are some wonderful childhood days that we enjoy this with bunch of friends. Your one is exotic and more delicious and I want to thank you to bring back some good memories. And friend India is waiting for you with arms wide open hope you enjoy great time here! Woow!!! Nice easy roasted corn dear. Enjoy ur India trip dear. You reminded me my childhood days in India..specially in monsoon..and ahhhh the smell of roasting corn on the street...I make here as well, use redchilli powder...Enjoy your break!!! We will miss your wonderful food! This corn looks delicious...it screams summer! Enjoy ur stay and sure we will miss ur dish and clicks.. they looks awesome.. corn anytime I am in. 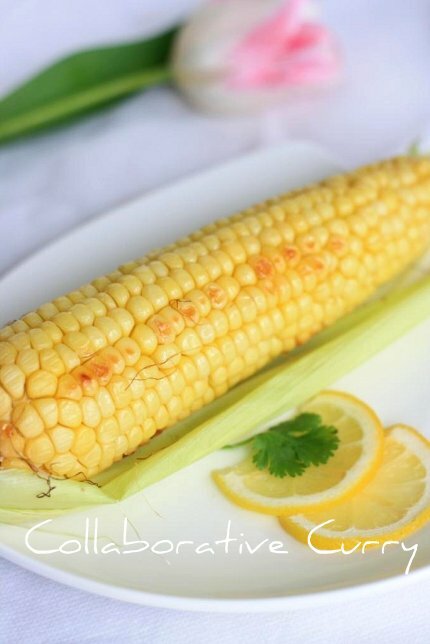 Lovely corn recipe. Enjoy your stay! Roasted corn is a wonderful summer treat. Enjoy your vacation. We will be here when you return. Enjoy your trip, see you soon! Hi. Lovely pic. Enjoy ur holidays dear, will miss u.
lovely recipe :)... i just love this dish....:) thanks for sharing :).. great pic :).. where is gulmohar??.. i dont see her posts lately ..
:D..hehehehe...lol....i honestly didnt know Namitha and Gulmohar were one and the same person.. enjoy your vacation !! Very nice and interesting recipe. I love corn very much and seeing the tempting pic I cannot resist myself. Love corn on the cob! Have a lovely vacation in India. I'm going to have to try this recipe. I tried something similar at 350 without the broiler step. I like that the kernels stay plump despite. wow.looks so inviting. i wish could eat it fully.